Step 2. Hit Volume Up button then connect a micro-USB cable from your S6/S6 Edge to your computer. Step 3. 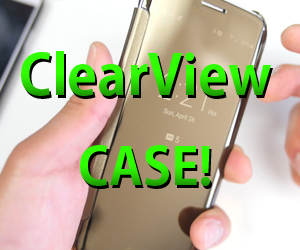 Go to our CWM/TWRP page and downloading TAR version of TWRP for your model of Galaxy S6 or S6 Edge. Step 4. Download ODIN3_3.10.6.zip and unzip. Step 6. Run the ODIN program by double-clicking on it. For Mac or Linux, you can use JODIN instead. Step 7. You should see a box in blue with a random COM number. If you do not see this, you don’t have S6/S6 Edge Windows drivers installed, download S6/S6 Edge Windows drivers, run the driver program and you should see it. Step 8. 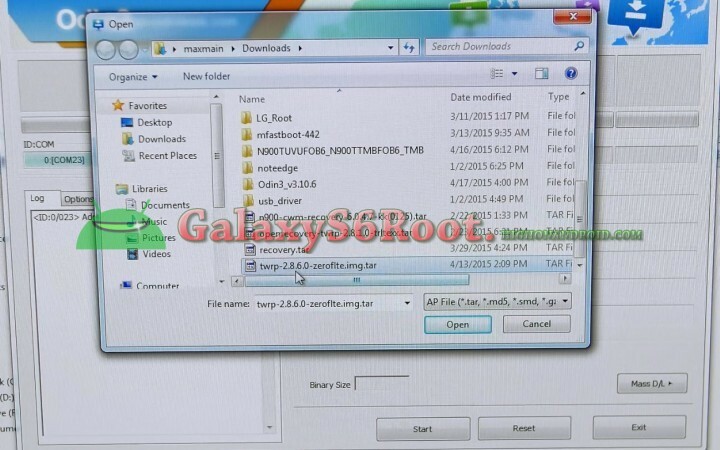 Choose “AP” then select the TWRP TAR file you downloaded earlier. Step 9. Hit “Start” then IMMEDIATELY hold down the Volume Up, Center Home, and Power buttons together. Step 11. Choose Reboot->System and if it asks you to disable overwriting of recovery (or something along those lines), say YES. That will disable your OS from overwriting the TWRP recovery you just installed. Does this method trip Knox counter? Yes all root methods currently trip Knox counter. 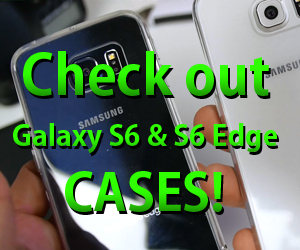 Hey Max, the Galaxy S6 notification fonts are so small and tiny. Is there any way to make the notification font bigger? Same as to what Steve said, any news on the AT&T and Verizon models? 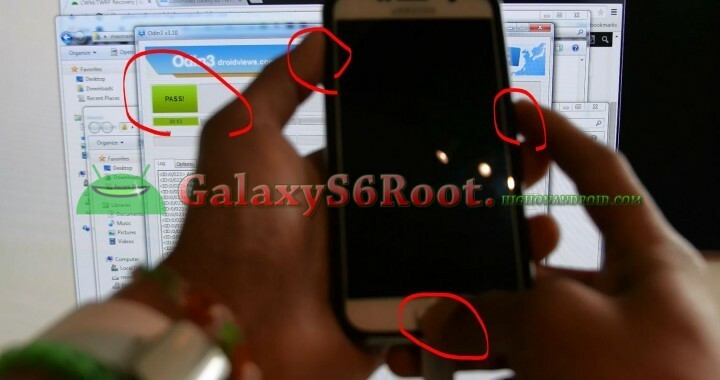 Galaxy S6 Gp20i is hanging at Samsung Screen. Any thoughts? Hey, I was thinking about doing this on the SM-G920V (Verizon S6). Before I do it, I just wanted to see if there was anyway I could see the Knox status. I tried the Volume-Down + Power + menu button. and that brings me to the Odin screen. But I do not see any reference to Knox in the information. Is that normal? what does everyone else’s look like? Please don’t try on Verizon or AT&T S6 as it has a locked bootloader, you cannot root those atm. I just tried this on G925W8 – stuck in bootloop. I flashed in Odin (AP), but didn’t do key commands for TWRP while flashing was happening…. any way to get around this now? 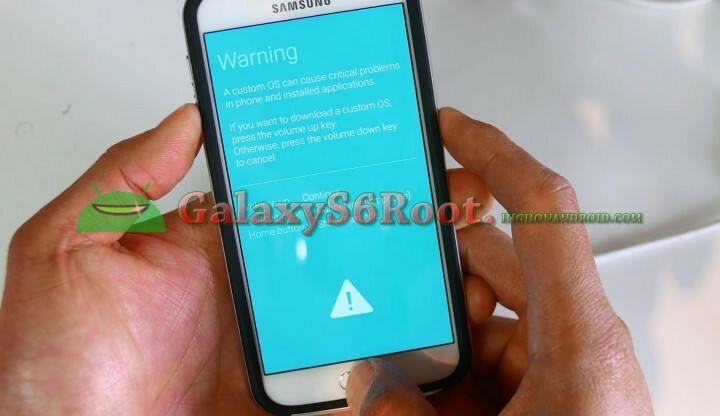 please give me Flameware + TWRP + GPPS for Android 7.1 Nougat for my “Samsung Galaxy S6 SM-G920A”–>> (Baseband Version: G920AUCU4DPH5 & Build Number: MMB29K.G920AUCU4DPH5 Android 6.0.1 Marshmallow “current device” ) ???? When I installed Superuser, on reboot, it blinks the Galaxy S6 (black and white) screen. How can I fix from here? Try the fix listed at bottom of this page. I can’t get Super Su to show up in TWRP for me to install it. It makes no sense. 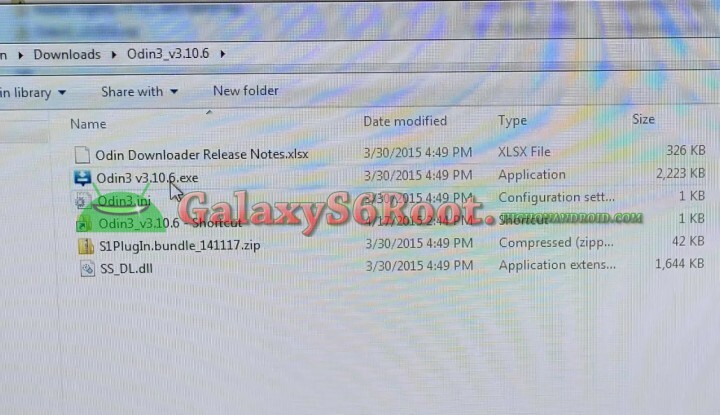 Did you copy SuperSU zip file over? Have you ever thought about adding a little bit more than just your articles? I mean, what you say is fundamental and all. Nevertheless just imagine if you added some great visuals or videos to give your posts more, “pop”! Your content is excellent but with pics and videos, this website could undeniably be one of the very best in its niche. Terrific blog! I can go from turned off to recovery mode, but nothing happens in download mode. Also can any phone that has a Knox counter on it S3 s4 s5 what ever be rooted with out setting of Knox? ? I see that the root and custom recovery is here, but I cannot find any custom ROM’s to install, are they not available, in the works, or can you direct me to a source for DL? SM-G920W8, SM-G92 0 W8 (Canadian)??? you meant SM-G920W8, SM-G92 5 W8 (Canadian), right???? Max, after the TWRP boot while on the TWRP screen, my Sprint SM-G925P touchscreen is unresponsive and will not let me select anything. This is my first time rooting this particular phone. I downloaded the odin file twice but there is no .tar file in it. Am I doing something wrong? does the mobile hotspot on sprint version work with this root? Any roms out for the s6 sprint? I cant rebbot into recovey. ive tried it many times the satus reads PASS but i just cant rebbot to recovery to be able to instal supersi zip…what can i do? Thanks for such a detailed post. I am on OE3 firmware (gm-925I) and its blocking the installation of custom recovery. While i press start and immediately hold volume up,home center and power button Odin says failed and on the phone it gives some message saying custom recover blocked or something. Any other way to Root? Thanks in advance !! THANK YOU!!! I’ve been battling for days trying to install ANY custom recovery on my 910f COJ3 without success and this cured it!! Hi, I have tried from step 1 to step 8, however, when I reached step 9, it doesn’t work anymore and my screen is stucked on the Samsung S6 logo. Any help. Will this method work on it? Testeado en Telcel Mexico. Trabajando. Max I follow the instructions to the t on my SPrint Galaxy S6 Edge. Immediately after i hit start on odin i hold vol up power and center home i the galaxy s6 edge splash green comes up i release power i am still on the flash screen I am using the proper s6edge twrp file G9250-TWRP-2.8.6.0-CN(0421).tar I am not sure whats going on? Hey Max is it possible to root a Canadian wind mobile sm-g925w8 since I don’t see it listed? Max i rooted following the procedure twrp.. then got a bootloop the followed the cf root method. I still have twrp recovery however i now have the error “unauthozed actions detected…” pop up. Does any one have a solution? 2. emergency recovery function in the smart switch PC software. so kindly advice me how to fix this cell phone back..
My S6 edge keeps going into a loop at start up. Ran the recovery and tried installing twrp again but got the same issue. Does this work on sm g925p on 6.0.1 b6 build??? Hey Steve, haha our names. Man i’ve been going nuts looking for what you are! 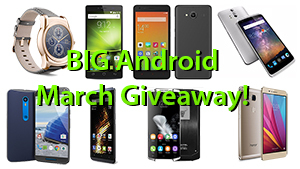 I can find G925P OR Android 6.0 but not both in one. Have you found a way to root the same device I have? So for the model number SM-G925A there is no way to root it? Are there any alternative ways to root this model, or am I just screwed? sm g925p build number and does it work? 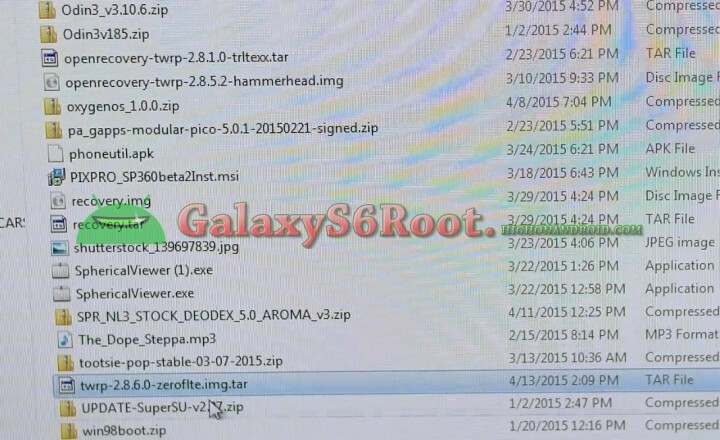 Next story KNOX Counter Cannot be Reset on Galaxy S6 or S6 Edge with Root! 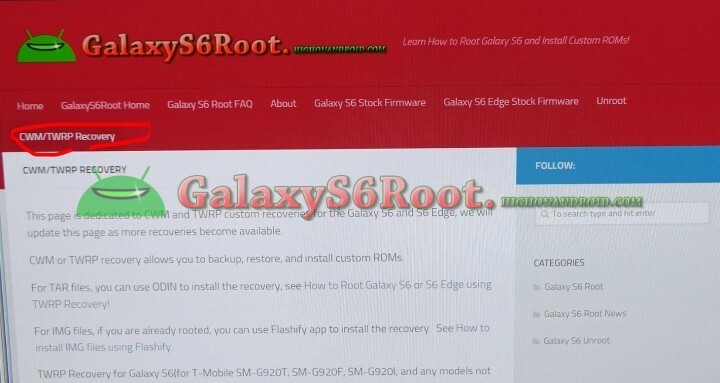 Previous story How to Unroot Galaxy S6 or S6 Edge!